You know those moments of anticipation in a hotel. You're holding your room key, and you insert it into the door, a little excited about what will be on the other side. Is it the room you saw on the website? The one with the sweeping views of the city skyline, the oversized balcony and the newly-installed down comforter and silk, duvet cover? Or is it the one down the hall and around the corner, with the grimy carpet and a view only if you stick your head out the window and crane to the left? It's up to the front desk clerk to decide whether you get the room with the view, or the one across the hall from 17 teenagers on prom night. They're both the same price. Do you tell the clerk she looks like a gorgeous celebrity? Or maybe you should just try Room 77? Room 77, a service that lets people request specific hotel rooms online, released late Wednesday a meta-search engine that lets people get very specific about the rooms they can choose. Now users can search by type of view (city, garden, pool, ocean, etc) and its grid-view shows you a comparison of different room prices at various hotels. 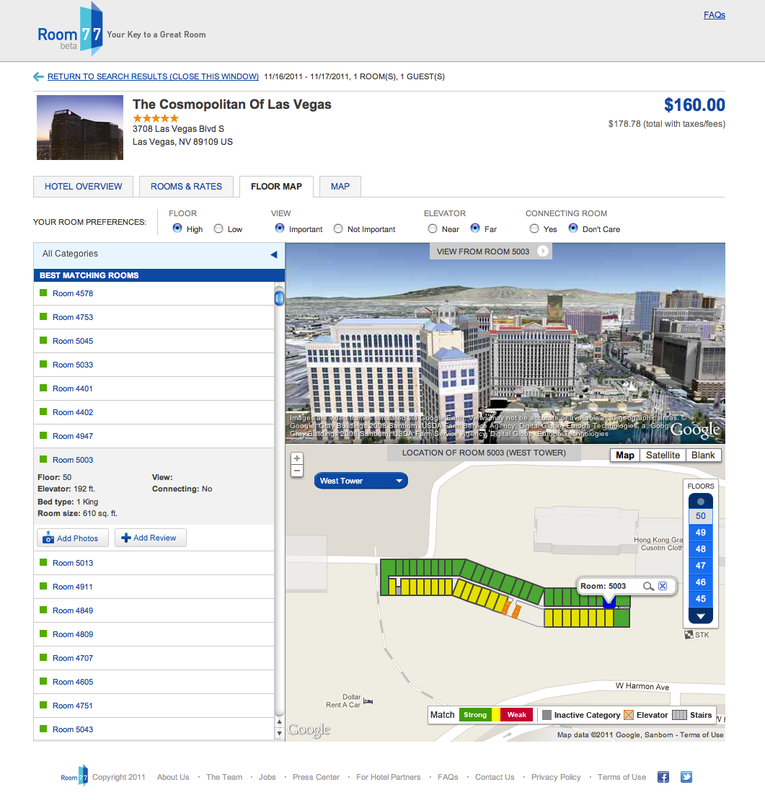 Once you drill down into a specific hotel, you can see information on the rooms like square footage of room, distance from elevator, type of view with an image of the view from that room and insider tips. If you book on the site, then you get access to a room concierge who will help you get the best room based on your specific preferences (distance from elevator, high floors, connecting rooms, etc). Of course, there's still no guarantee you'll get the room you want. “Guaranteeing specific hotel rooms at the point of booking is not possible today because the technology at the hotel is not there yet. But in the future, revenue management at a more granular level, even down to the room could be possible,” said Room77 General Manager Kevin Fliess. The service, which launched this past February, was born out of frustration by the founder and former hedge fund manager Brad Gerstner, who traveled frequently and never knew which room he'd end up with. He started keeping a list of specific rooms and notes on those rooms. Friends started asking for his list so he realized that there was a need to create transparency around hotel rooms and empower the user. Room 77, which has raised $13.5M from investors like General Catalyst Partners, Bob PIttman, Erik Blachford (former CEO of Expedia) and Rich Barton (co-founder of Zillow), started out indexing hotel rooms and views at the most popular hotels across the US and major cities worldwide. Hotel room layouts are not readily available and many hotels only have room information on a hard copy sheet in a binder at the front desk. Room 77 is manually collecting hotel room layouts either from the hotel front desk or in cases when it is not available, it takes a picture of the exit route maps on the backs of hotel doors. Behind the service are ex-Google search engineers who have developed patent-pending technology on top of Google Earth to generate simulated hotel room views by plotting latitude, longitude, and altitude of each room. In addition, they have consumers submitting their own hotel room view photos, room reviews, and interior pictures. There is a natural corollary between hotel-room management and airline seat management. It used to be that you booked an economy seat but didn’t know which seat you were getting until checkin. Now you can read reviews of each seat on SeatGuru.com and airlines like Virgin are starting to charge more for premium seats like the exit row. I’m sure the hotels will eventually want to move in this direction to be able to extract more revenue. Disclaimer: Erin Håkansson is a Registered Representative of Ackrell Capital, LLC, a member of FINRA and SIPC. Nothing in this posting should be construed as investment or financial advice.